Have you noticed the kids out kicking the football around! That is a pure sign colder weather is on the way. This note is just a friendly reminder that now is the time to let us get your car in condition for winter driving. Save yourself that last minute rush and worry… we will drain and clean your car’s radiator and protect it with Texaco PT (permanent type) Anti-Freeze… replace the old oil in the crankcase with Custom-Made Havoline, the Heavy-Duty motor oil, check the rear end and transmission and completely lubricate your car with long-lasting Marfak, plus checking lights, spark plugs, fan belts, hose and all the necessary accessories on your car. P.S. When you come in, be sure to ask for this picture of the Fire-Chief Pups. 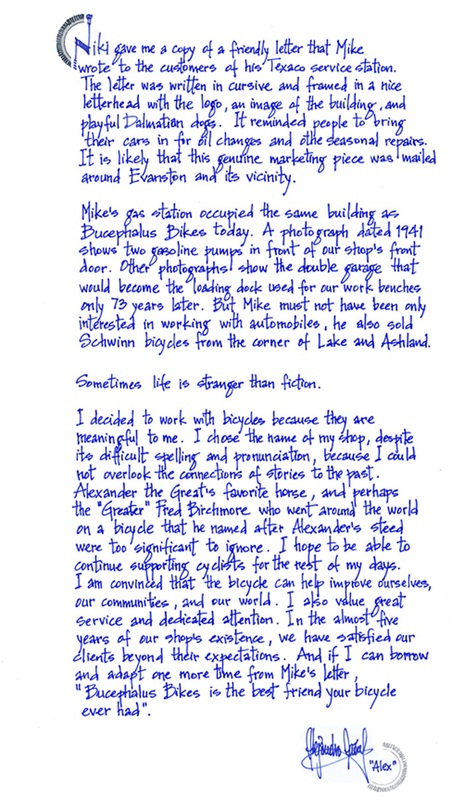 Niki gave me a copy of a friendly letter that Mike wrote to the customers of his Texaco service station. 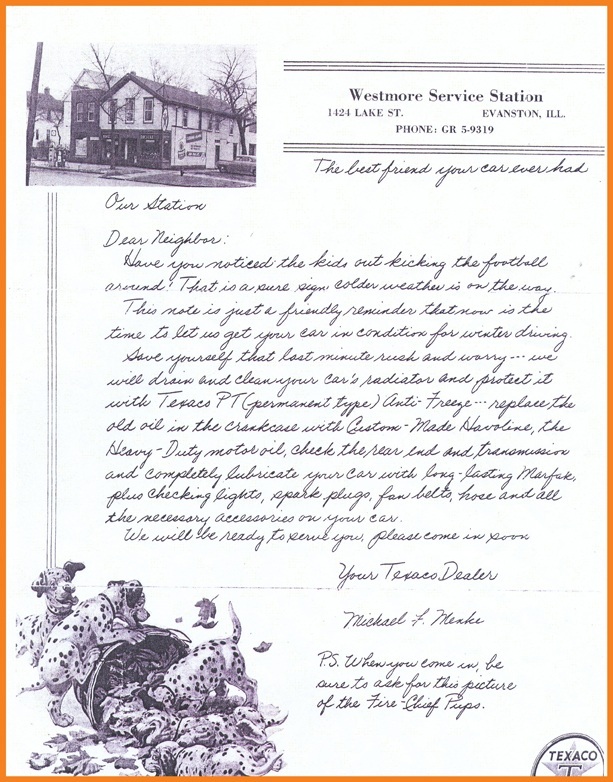 The letter is written in cursive and framed in a nice letterhead with the logo, an image of the building, and playful Dalmation dogs. It reminded people to bring their cars in for oil changes and other seasonal repairs. It is likely that this genuine marketing piece was mailed around Evanston and its vincity. Mike’s gas station occupied the same building as Bucephalus Bikes today. A photograph dated 1941 shows two gasoline pumps in front of our shop’s front door. Other photographs show the double garage that would become the loading dock used for work benches only 73 years later. But Mike must not have been only interested in working with automobiles, he also sold Schwinn bicycles from the corner of Lake and Ashland. I decided to work with bicycles because they are meaningful to me. I chose the name of my shop, despite its difficult spelling and pronunciation, because I could not overlook the connections of stories to the past. Alexander the Great’s favorite horse, and perhaps the “Greater” Fred Birchmore who went around the world on a bicycle tthat he named after Alexander’s steed were to significant to ignore. I hope to be able to continue supporting cyclists for the rest of my days. I am convinced that the bicycle can help improve ourselves, our communities, and our world. I also value great service and dedicated attention. In the almost five years of our shop’s existence, we have satisfied our clients beyond their expectations. And if I can borrow and adapt one more time from Mike’s letterr, “Bucephalus Bikes is the best friend your bicycle ever had”.